Phase 2 Cadet Jack and Phase 5 Cadet Matt. Was a life on the sea inevitable? Jack – Growing up living in Tenerife and the Canary Islands I’d obviously been by the sea and we got into dinghy sailing at quite a young age, I was about 10-11 when we started. 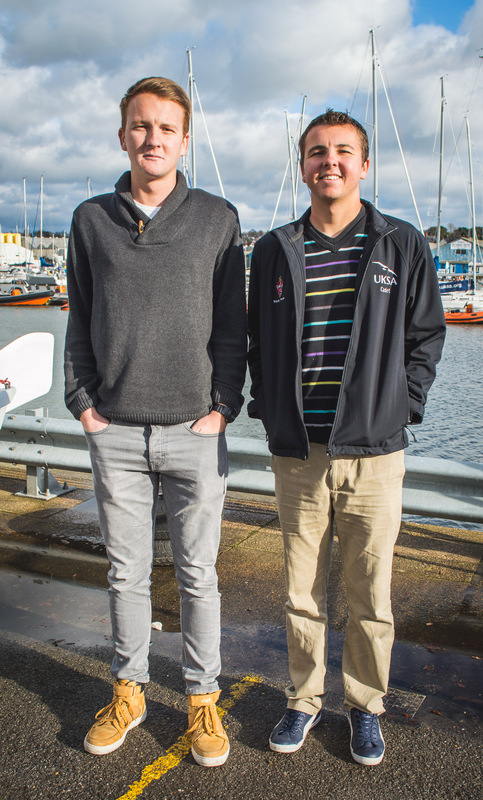 Sailing was never really serious, it was more of a hobby until my brother (Matt who’ is on phase 5) was looking for marine engineering degree’s and stumbled across UKSA its courses which lead to careers on board super-yachts. He had some moments of doubt when choosing it, he was quite scared of committing to the programme, but the way it was described to us when we went to the open day here and just seeing UKSA’s base we knew it was the best place to come and train (and have some fun!). When he got jobs on yachts in the Med it made me really jealous; so I applied and here I am! Matt – I’m on phase 5 at the moment, but I am back doing 2 courses, I’ve got about 8 days and then I’m back to my current vessel. I originally chose the course as a stepping stone to eventually earn enough money to go to university, but after 3 years of doing it, I enjoyed it too much. How has your funding through Trinity House helped? Jack – I managed to get funding through Trinity House which has helped me massively, I wouldn’t have been able to do it without the funding. Matt – It’s quite simple really, without it we wouldn’t be here. It’s a big commitment financially the cadetship. Some families have funding available but we didn’t and without Trinity House’s support I suppose we would have gone into yachting a different way. Why choose the Cadetship as an alternative to university? Jack – It’s a lot more active, studying for the next 5 years of my life wouldn’t have suited me. Yachting, and where it’s taken me, it’s just a great lifestyle. What have you thought about the course so far? Jack – The training is really interesting and intense, you do a lot of work, but it’s fun at the same time. You create bonds with people you’re working with. You go through some hairy moments, of course, sailing across the channel in fog and when it’s quite bad weather you wish you were somewhere else like a beach or something but it’s a really interesting part of training here. I’ve got friends for life since being here. What is life like on a superyacht? Matt – Out in the Med working is crazy and completely different to what anyone expects. It’s almost a wacky world with stuff going on; you hear these stories of this boat and that boat and we had some funny moments. I have been from Holland all the way to the Middle East just following the coastline, hugging Spain, France, Italy, Greece, Turkey… all of the! So far I’ve done 2/3 canals of the world, hopefully, in a few years’ time I’d have done 3/3, that’s the kind of thing you aim for travelling and seeing these amazing places. What are your top tips to anyone considering following your footsteps? Matt – The Superyacht cadetship is something that my brother originally witnessed and how it worked for me and he decided to do the same thing. I suppose that is proof that it worked out for both of us. It has been a great experience of travelling. That’s one of the main reasons we do it. I have been to the Caribbean including places like Jamaica and the Bahamas. The main thing is that I am able to see the world.